Here’s a question for you—which is more important, a person or the Law? Or to put it another way—would you like to be a hungry child in Paignton? I had never heard of Paignton in Devon til a few weeks ago when an unfortunate young lad wanted his school dinner. Jacob Lynn, an eleven year old boy at the local primary school went forward like Oliver Twist to collect his dinner and was refused in front of the whole class because his family were £1.75 in arrears in their school dinner bill. Paignton describes itself as ‘The perfect staycation, at any time of year.’ Seemingly this south coast town is some sort of well known holiday resort where an ice cream probably costs £1.75. Jacob’s father Gary resigned from the board of governors of the school over the incident and took his other child from the school as well. What rules made to be broken? But the case raises an interesting question; which is more important, the person or the rules? The answer to this question reflects more than a person’s attitude; most of the time it reflects the person’s position in society. We have good reason to believe that the economic, educational, tax and the laws of the land are designed or implemented to suit the wealthy. For example, have you ever heard of a nice middle class lawyer going to jail for the possession of cocaine? Yet everyone believes that cocaine is the drug of choice for lawyers. This may or may not be the case but there is enough anecdotal evidence to suggest that there must be some truth in the story. Or take the banking crisis. How many bankers have walked away from fraudulent activity and shady deals without a blemish on their character and in fact have received a large pension for their efforts? At the present time there are talks going on in the European Union as to what to do about failing banks. Minister for Finance Michael Noonan chaired a meeting of European Union finance ministers in Luxembourg last Friday, to seek agreement over a mechanism to wind down failing banks. If you read between the lines what Ireland really wants is to wash their hands of the AIB and the Bank of Ireland. Although there is relative silence about the Euro crisis at the moment there are still huge issues to be solved and the arrears in mortgages in the Free State is still growing. I spied an article on the RTE website at the weekend which revealed that 12.3% of all mortgages in the south are over 90 days in arrears. This figure flatters to deceive. Let me explain. It is now 2013, so people who bought their homes in 1988 are still paying mortgages. Take all the people who bought their homes from 1988 to, say, 2000; these people still have relatively small mortgages and few of them would be in arrears. The people in real trouble are the young people who bought their homes in the last 10-13 years. As you move forward from 2000 the percentage of those who are in arrears would grow steeply, so if we say that 12.3% of all mortgages are in arrears, what is the percentage of those who bought from 2005-2007? As I said, I spied that article on the RTE website. But what is a spy? My dictionary defines a spy as ‘an employee of a government, who seeks secret information in or from another country, especially about military matters,’ and I would bet my bottom dollar that this is the answer you would give to the same question. Edward Snowden has been charged under spying laws in the United States. He blew the whistle on the government when he leaked documents showing that the US security services were spying on their own people. But the question is, ‘who was Snowden spying for?’ He was spying for the ‘American people,’ as everyone loves to talk about. “Prior to Barack Obama, there were a grand total of three prosecutions of leakers under the Espionage Act. That's because the statute is so broad that even the US government has largely refrained from using it. But during the Obama presidency, there are now seven such prosecutions: more than double the number under all prior US presidents combined. How can anyone justify that? But poor old Glenn is missing the point. Had he listened to the Red Terrier from Castlebar, Enda the Great, he would have known that election pledges are meaningless. When Enda was wanting votes he promised the people of Roscommon that their hospital was safe. After the election the hospital closed. In fairness to Enda, when faced with a recording of what he said, he admitted that politicians make promises in campaigns that they know they shall not be able to keep. Even more than this, Glenn is missing the most important point of all; you can use the law or the rules to justify anything. If you want to make something legal you can do it. Look at our own wee bit of a country. The Special Powers Act over ruled all other laws in this land. With it the army built camps wherever they wanted, the police refused information to people about their missing relatives whom the people knew were in police custody, and most famously of all, the Special Powers Act made allowance for internment. The law has been used to oppress people since laws were first made. There was one great example of the abuse of a law that backfired on the UK in these past few years. And it made me laugh. Do you remember when the banks in Iceland went burst in 2008? Alistair Darling used anti-terrorism rules to take control of assets held in Britain by a troubled Icelandic bank. “The Treasury released a document to Parliament yesterday showing it used sections of the Anti-terrorism, Crime and Security Act 2001 to take control of the bank's assets, saying in the statement the bank's collapse may harm the U.K. economy. However, in effect the British were calling and treating the Icelanders as a bunch of terrorists. When it was all settled the Icelanders did not pay a penny back and defaulted on the whole lot. As an aside, but a very important aside; at the time the Irish government said that Ireland had to pay the bondholders, no matter what. Iceland defaulted. Now Iceland has 5.5% unemployment. Ireland is at 14%, but remember that 300,000 of our young people have left in these past four years. This is the worst period of emigration since the famine. Iceland has no emigration. Their children are not in Australia. If all our young people were still here unemployment would be at 25%. Growth this year in Iceland is expected to be 2.5%; Ireland is stagnant at best, but probably in recession overall. In Iceland the people were not forced to take on bank debt and the bankers were treated severely. In Ireland the bankers got a big pension! Finally, instead of forcing people from their homes and choking a generation with huge mortgages, all mortgages in Iceland were written down to market value plus 10%. The people were given a chance. But then the Icelanders were terrorists according to the British! Just as well they don’t have drones. Note the position of the words, ‘necessary, legal and just.’ The argument here was not so much the killing of a few hundred Pakistanis but the killing of four innocent American civilians. An action, particularly by a government, should first of all be just; justice should be the overriding principle of every government’s actions. Necessity and legality should follow justice, not the other way about. But we have lost that principle. It is hard to pinpoint when exactly this came about in the UK, but the bombing of Dresden between the 13th and 15th of February 1945, when 25,000 people were killed, or David Steele’s private member’s bill of 1967, might be good places to begin. 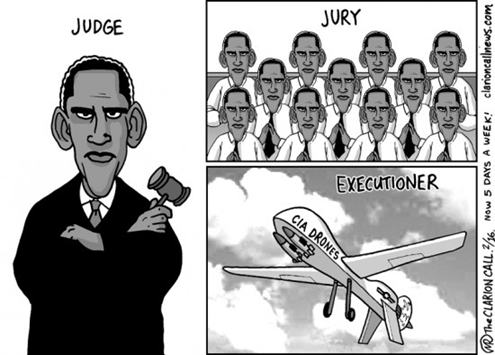 When it becomes right to refuse a child a meal over a pittance, when laws are not enforced because the lawbreakers are middle class, when bankers and the money interests of a few are more important than people’s homes, and when whistleblowers are charged as spies, why should we be surprised when a government can justify killing their own civilians with drones? There is no moral compass in society; we no longer know what is right or wrong. You see, when you are well off you can play by the rules. All this changes the moment you lose the job and the house and the position in society. A third of the entire laundered diesel in diesel in the UK is sold in Northern Ireland. Are we all criminals or are we just not able to afford the high prices of fuel? “Nearly a third of all illegal fuel sales detected in the UK in 2012/13 were in Northern Ireland. The figures, released by Her Majesty's Revenue and Customs (HMRC), show that of 388 detections in the last year, 128 were in Northern Ireland. Of the 49 manufacturing sites discovered, 22 were in Northern Ireland. What is the moral compass that we are using in our society? In 2010 Fintan O’Toole wrote a book called ‘Enough is Enough,’ in which he called for the establishment of a new Irish republic. As a moral compass for the new republic, O’Toole calls for ‘five decencies’ that might lead its citizens into a safer, fairer, less market-driven future: security, health, education, equality and citizenship. What happens in reality is that when people begin to promise a Utopia in the new republic, anything is justified to achieve the aim of this brave new world. This is exactly what Chairman Mao said when he killed 100 million Chinese so that a new world order could be created, or Stalin when he forced collectivisation on starving peasants. You see, humans can’t make their own moral standards because every one of us has that one flaw which plagues us all; human nature. We are greedy, selfish and self centred. When people make the rules, then the rules become more important than the people. They have too because there is now nothing higher than the rules. Such things as kindness, (give the child a meal) integrity, (the government is spying on its own people so let’s tell the world) or justice (we have the drones, we can use them as we want, and anyway no one else has drones to fire back at us) have no place in a world of rules. Laws are laws and cannot be broken; rules must be obeyed. And all the while people ignore the rules. You can be sure many children have been given meals when their account was in arrears because good decent people know the rules are silly. Long after Bertie Ahern, Brian Cowen and Enda Kenny are gone history shall relate how ordinary people survived in an Ireland that not even Fintan O’Toole could put right. And they shall survive simply because they shall evade the rich man’s rules as far as possible. The northerners shall do what the northerners have always done; fiddle the British out of as much as we can because the system is stacked against the little man. And when Obama and Edward Snowden meet at the pearly gates, who do you think shall stand with the most integrity before God? Remember, He broke the rules. He healed the cripple of the Sabbath. He put the poor sick person before the Law. And what did the nice people do? They hung him on a cross. Do you think they wouldn’t do that today? Have any comments? Submit via this blog or send us an e-mail: turloughquinn@hotmail.com.